snowdeal.org > ex machina: our local, organic bees didn't get the memo about colony collapse disorder. our local, organic bees didn't get the memo about colony collapse disorder. like their bee brothers and sisters around the world, our local, organic bees are thriving while much of the rest of the population is suffering from colony collapse disorder. i've heard more than one local bee keeper theorize that the culprit is high fructose corn syrup produced from genetically modified corn containing bacillus thuringiensis, but apparently the data doesn't fully support that conclusion. 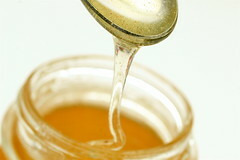 whatever the reason, we're thankful to have what seems to be a nearly unlimited supply of yummy raw honey fit for a pooh.